Hello Sylvia, could you introduce yourself in a few lines? 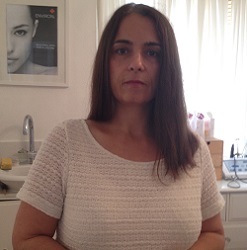 I am 53 year old female and am a Holistic/Beauty Therapist as well as a family support worker for an addictions agency. I am the youngest of 12 and up until recently a full time carer for my husband who was physically disabled and suffered with bipolar and had Asperger’s. I was recently widowed in May 2015. When were you diagnosed with depression and how did you get the diagnosis? I was first diagnosed in March 1987 with post-partum depression following the death of my mother, a split from a 7 year relationship, homelessness and giving birth. These events all occurred within a 7 week period. That was my baptism of fire although retrospectively I can see I had difficulties prior to this. Was it hard to cope with the condition? Has it changed something in your relationship with your family? The feelings of intense anxiety, feeling lost, abandoned and totally alone were overwhelming. Were it not for one sister in particular and my faith in Almighty God I am not sure where I would be. Family relationships have remained unaffected. You’ve been taking antidepressants for a while, what has been the worst side effect you have had? The medication that I am on currently is Citalopram from which I am weaning myself off. I wouldn't say any of the medications I have been on have been particularly helpful in fact the opposite is true. The worst side effect I have experienced would be several transient attacks most recent March last year, fainting and subsequent concussion, brains zaps, difficulties swallowing, post nasal drip, bleeding under the skin (painful), difficulty breathing, aching muscles and joints, the list goes on. As for today, do you think therapy and medication have made you feel better? I believe very strongly that the first port of call in connection with depression and anxiety ought to be a review of food and liquid intake after all you wouldn't put a plant in an environment it would not thrive and expect it to flourish. We tend to eat plastic processed foods which do not provide us with the raw materials to allow our bodies to function. If we want our plant to thrive we plant it in the type of soil it needs to be healthy and vibrant. Likewise we ought to be doing the same. My mental health has improved as a result of that approach. You have a special family history, do you think that it has influenced your depression? It is true that birds of a feather flock together that's important for support and getting through massively difficult times. My sister's and I help each other although I do also think it equally important to have associations with a range of individuals not just those of us with depression or anxiety so that new positives can be learned. You are a holistic therapist, since when have you been in practice? Have you found it helpful? I have been practising Holistic Therapies for eight years using massage, reflexology, aromatherapy and nutritional therapy for the last eight years. I worked with a number of clients with different needs. I volunteered for four years with the addictions agency I am now employed by. My client base were those with addictions and it was because of my own experience with anxiety and the lack of non-medication based treatments for this that I approached The Matthew Project. The results were amazing. Clients reported reduced anxiety, reduced use of drugs including prescribed sleeping tablets. I have worked with clients with sleeping issues, chronic pain, chronic anxiety etc. My positive message is..."where there is life there is hope"
Medication is not the only model of care certainly for many it will be the preferred model. There are other alternatives even if you do want to stay on medication. There are professional organisations who can help and there is much that can be done to help oneself. I am happy to sign post and offer what information I have to anyone who wants it. I truly believe in a 360 degree approach, it's not just about nutrition, cognitive function also needs to be addressed. There are lots of therapies out there including transdermal magnesium therapy (which you can use at home) as long as you don't have any problems with your kidneys. As with anything get clearance from your doctor first. Never try and come off medication without support from your GP and if you do, it must be done gradually with vitamin and mineral support.